Need a dance break during PodCamp Ohio? If you find yourself needing a dance break, background music for your personal podcast or some relief from the pressure of your iPod headphones during PodCamp Ohio, you’re in luck. 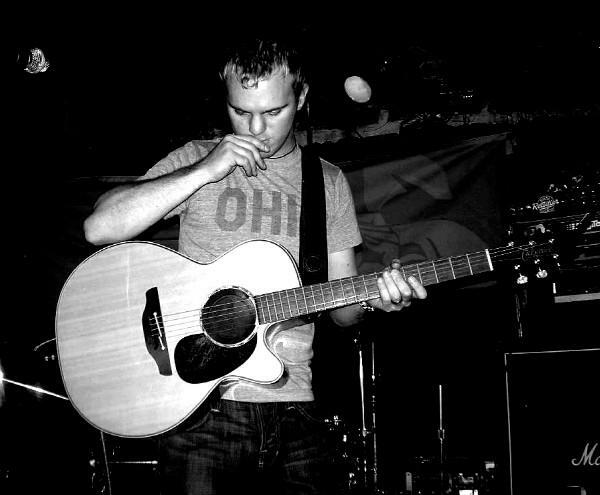 Mike Genovese, a solo, acoustic musician from Columbus, Ohio (via Cleveland), will provide lunchtime tunes at PCO starting at 12:30p at ITT. Read his official below to find out more, but I can tell you from experience, it’s sure to be a good time! Mike captures audiences with his engaging live performances. Inspired by artists Tim Reynolds, Howie Day and Joseph Arthur, Mike incorporates the use of a technique called “looping” or “sampling” that happens LIVE by adding layers of sounds, finally creating the presence of a full band. You’ll be tapping your feet when Mike cuts phat beats (yes, phat…) live on-stage to accompany his songs. 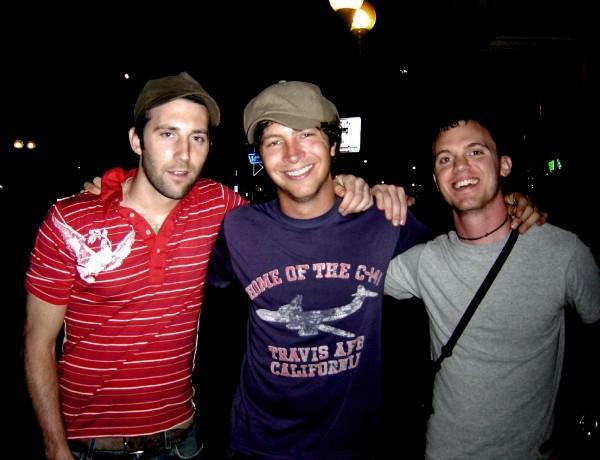 Although still relatively new to the music scene, Mike has shared the stage with many national acts including: Pat McGee Band, Ari Hest, Matt Wertz, Mat Kearney, Jump (little children), Lifehouse, Tim Reynolds, Stephen Kellogg and the Sixers, Virginia Coalition, Jack Johnson, G. Love and Special Sauce, Blessid Union of Souls, Matt White, ZOX, Michael Tolcher, Rusted Root, Collective Soul, Cary Brothers, The Clarks, Josh Hoge, Mason Jennings, Blue October, Carbon Leaf, Red Wanting Blue, Oval Opus, Mieka Pauley, and The Damnwells. Watch for Mike’s latest CD due out this year! We’re having a PodCamp meeting tonight at 8pm. 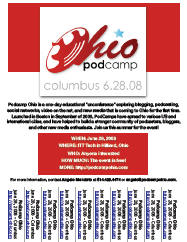 Anyone planning to attend PodCamp Ohio is welcome to attend the weekly meetings. Please help us promote the event by printing and posting the flyers we have available at your local coffee house, library and/or community boards. There are three flyers to choose from. If you have a black and white laser printer, please use the black and white flyer for the best results. “It’s all about learning, getting hands on with new media and spending time with folks that make up your online community,” said Angelo Mandato, coordinator of PodCamp Ohio. “By attending PodCamp Ohio, members of the blogging, podcasting, marketing, academic, and business communities will lead the charge toward embracing and effectively utilizing new and social media in our area,” he added. PodCamp Ohio offers a unique opportunity for attendees to learn, share or grow their new media skills. They can attend informal sessions, created and driven by participants, about podcasts, blogs, digital music, web video and related aspects of new, Internet-based media. The format allows both beginner and expert media producers, as well as listeners, watchers and readers, to participate, discuss and network. PodCamp Ohio is presented by ITT Technical Institute in Hilliard, OH (Columbus metro). The event is open to the public, but registration is required. To sign up or learn more, visit 2008.podcampohio.com. Experience with podcasting or blogging are not requirements to participate; professionals of any industry, hobbyists and students are encouraged to attend. Sponsors are still being accepted. If you are interested in sponsoring PodCamp Ohio, contact Angelo Mandato by calling (614) 429-4474 or sending an email to angelo [at] podcampohio.com. 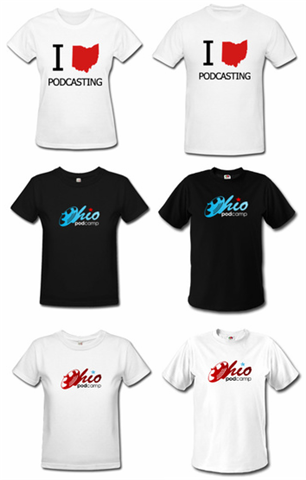 PodCamp Ohio T-shirts are now available! There are three types of shirts to pick from. Ladies pictured on the left and mens on the right. The “I Ohio Podcasting” T-shirts include the PodCamp Ohio logo on the back. The remaining T-shirts have the date of Podcamp (06.28.08) on the back. All shirts are sold at cost. Thanks Brian for getting these together for us! PodCamp Ohio Registration is now available! I would like to thank Joe for his hard work developing the registration system. This custom registration system is allow us to gather information that we otherwise would not have gathered. If time allows, Joe will be adding some very cool features to the registration system that will allow us to see a Google map with points marked where attendees are coming from. If you plan on attending PodCamp Ohio, we strongly encourage you to register as soon as possible that way we can accurately report attendance to sponsors, vendors and session planners. If you will need accommodations, please visit the Travel Information page for special hotel rates and directions. Vote to see Grammar Girl in Columbus! If you haven’t herd, Grammar Girl is running her own election this March to see which cities she should visit during her summer tour. If you would like to see Grammar Girl come to Columbus and possibly attend/speak at PodCamp Ohio, please send an E-mail to city@quickanddirtytips.com with the subject “Columbus”. It would not hurt to add a note in the body of the message that you would like to see her at PodCamp Ohio this June 28th as well. In this episode we talk about pre/post event planning, promos, registration and session planning. Dave is going to look at the possibility of getting podsafe entertainment for the night before PodCamp. Dave and Matt are working on creating promos. We go over the registration page that Joe designed, it is very close to going on-line. We also discussed the Attendee Directory page that will be going live when registration goes live. We’re going to twitter the users who register with the option selected to be included in the Attendee Directory. The twitter message will start with @twitter_name + description twitter style from registration. If you’re following PodCampOhio on Twitter, you’ll know who to follow who’s going to be attending PodCamp Ohio! We talked about planning sessions. We discussed the idea of reviewing the proposed sessions with a committee or accepting sessions in the order they are received. We decided to stick with accepting session in the order they are received. While brainstorming we took Scott’s idea of having lightning sessions with the idea that the lightning session would be on a specific topic such as Web Site Tools. We discussed revising the web site, we’ve removed the ‘The Podcasters’ section of the blog roll and created two pages, one for Organizers and Volunteers and another for PodCamp Ohio Fans. Next Talkshoe meeting is Thursday, February 28, 2008 at 8 pm. Feel free to subscribe to our feed and calendar for the latest updates.